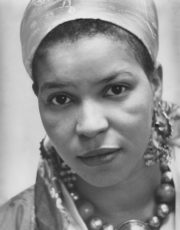 We mourn the passing and celebrate the immortal contribution to our culture of Ntozake Shange, who, according to cultural critic Melissa Harris Perry, did more than any other artist to remind us that Black women's lives matter. Shange was unflinching in taking on domestic violence and patriarchy in the context of racism and classism, neither exempting African American men from critique nor allowing them to be scapegoated by white society. She was also groundbreaking in her creation of the "choreopoem," combining poetry, dance and music in her classic work, "For Colored Girls Who Have Considered Suicide/When the Rainbow Is Enuf" and subsequent works, which anticipated what we now call "spoken word." We'll listen to excerpts from readings by and interviews with Shange over the last 35 years.